Welcome to our blog hop and giveaway with our friends at Paper House Productions! We are bringing on sparkle and shine into papers and our adhesives during the week. Excited to share tips and inspiration from both design teams. 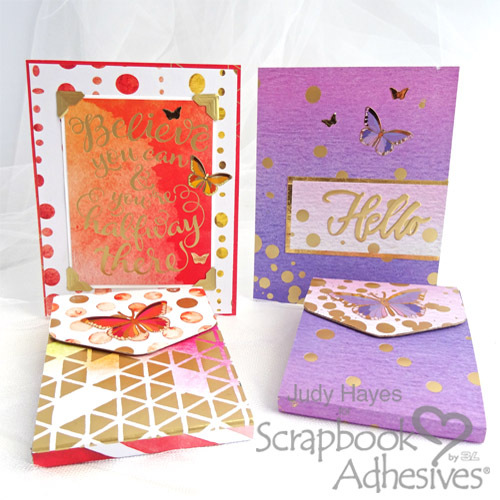 Today, Judy Hayes and Valerie Ward will start us off with their beautiful and sparkly projects. I had fun using papers from Color Washed 12ʺ Double Sided Foil Scrapbook Paper to cover little notepads and add Butterflies Faux Enamel Sticker! Using Adhesive Sheets 6 x 12 inch to the back of the paper before cutting and covering notepads makes it so easy! For extra sticking power at the folds and ends, I used E-Z Runner® Ultra Refillable Dispenser. I also made coordinating note cards using papers from Color Washed Cardstock Multi Pack, and embellished with Butterflies Faux Enamel Sticker and Color Washed Cardstock Multi Pack stickers. One card features Creative Photo Corners Gold and was assembled with E-Z Runner® Permanent Strips Refillable Dispenser. The other card has a shiny gold border created with Premium Double-Sided Tape ¼ʺ and gold foil from 3D Foam Holiday Embellishment Kit. It was also assembled with E-Z Runner® Permanent Strips Refillable Dispenser. These notebooks and cards are fun and easy to put together! I like to keep a few of these on hand for quick gifts. For a tutorial and more details on my blog, click Butterfly Note Pad and Cards. 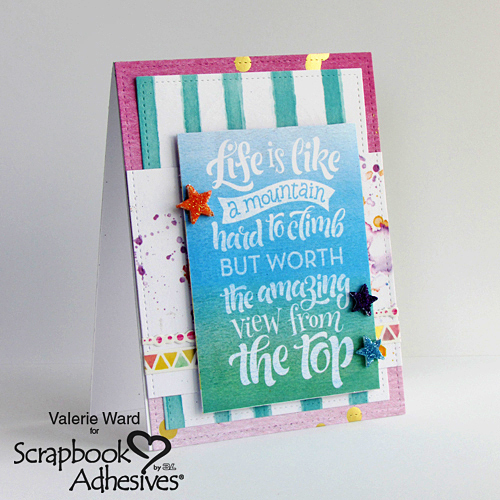 Today I’m sharing my project, an A2 sized card, using several products from the Paper House Color Washed collection! I used papers from the amazing Color Washed 12″ paper pad, stickers from the fun Color Washed Cardstock Multi Pack, and a sheet of the gorgeous Color Washed 12″ Double Sided Foil Scrapbook Paper. I used my E-Z Runner® Grand Refillable Dispenser to adhere the different pieces of cardstock down. I popped up the sentiment box with Crafty Foam Tape in White. I wanted to add some sparkle, so I got some stars from the 3D Foam Holiday Embellishment Kit. I peeled off the liner, and sprinkled glitter on them, then glued them onto the card with my Dual Tip Glue Pen. 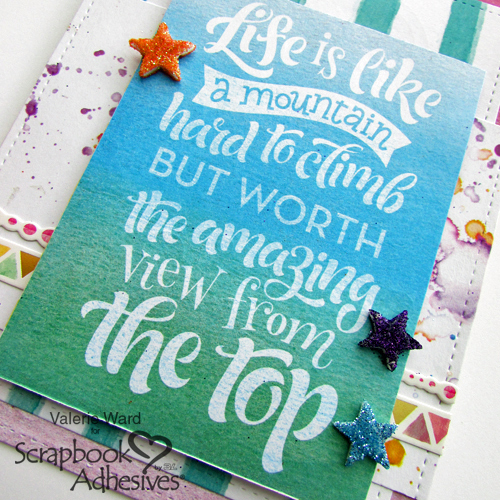 See Day 2, CLICK: Sparkling Scrapbook Pages with Paper House Productions Blog Hop – Day 2. Find Day 3, CLICK: Sparkling Projects with Paper House Productions Blog Hop – Day 3. Visit Day 4, CLICK: Sparkle with Paper House Productions Blog Hop – Day 4. Day 5, CLICK: Sparkle and Shine with Paper House Productions Blog Hop – Day 5. 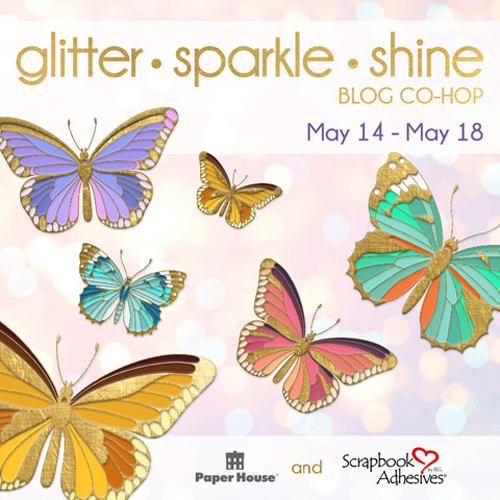 Sparkle Blog Hop with Paper House Productions + Scrapbook Adhesives by 3L – Day 1. If you cannot see the comment section (at the bottom of this post), please CLICK: Let’s Sparkle with Paper House Productions Blog Hop – Day 1 and scroll down to the bottom of the post. This entry was posted in 3D Foam Squares, Adhesive Sheets, Adhesives, Announcement, Cards, Crafts & Tutorials, Crafty Foam Tape, Creative Photo Corners, E-Z Runner® Dispensers, E-Z Runner® Grand, Gifts, HomeHobby by 3L, Permanent Adhesive, Premium Double-Sided Tapes, Wear your Adhesive on the Outside and tagged 3D Foam Holiday Embellishment Kit with Foil, 3D Foam Squares Mix White, 3D Foam Squares Regular White, 3D Foam Squares Small White, Adhesive Sheets 6x12", Blog Hop, Card, Card Making, Crafty Foam Tape White, Creative Photo Corners Gold, Creative Photo Corners Mix Pack, Dual Tip Glue Pen, E-Z Runner Grand Dispenser, E-Z Runner Grand Permanent Strips Refill, E-Z Runner Permanent Strips, E-Z Runner Permanent Strips Refill, E-Z Runner Permanent Strips Refillable, E-Z Runner Ultra Refill, E-Z Runner Ultra Refillable, HomeHobby by 3L, Judy Hayes, Note Pad, Paper House Productions, Premium Double-Sided Tape 1/4", Valerie Ward. Bookmark the permalink. 41 Responses to "Let’s Sparkle with Paper House Productions Blog Hop – Day 1"
I love the card ideas. Anything with glitter or foil will give me inspiration. I need more adhesives always. Who doesn’t love butterflies?! And sparkly ones are the best. Get combo to work with to create these beautiful projects. Thank you for sharing, I look forward to following the blog hop through the week. A terrific start to the Blog Hop! Love the note cards by Judy Hayes! Such beautiful inspiration!! Love your products! Love the pretty notepad and card set as well as the wonderful inspirational card. Thanks for sharing !
. Everyone needs a little note pad for jotting down notes and why not have one with style tfs. Wow! All the projects are so beautiful! Is there anything that can’t be improved with a bit of golden shimmer and some pretty colours?!? I love the watercolours in the pretty papers and the shimmer gives them such a magical feel. 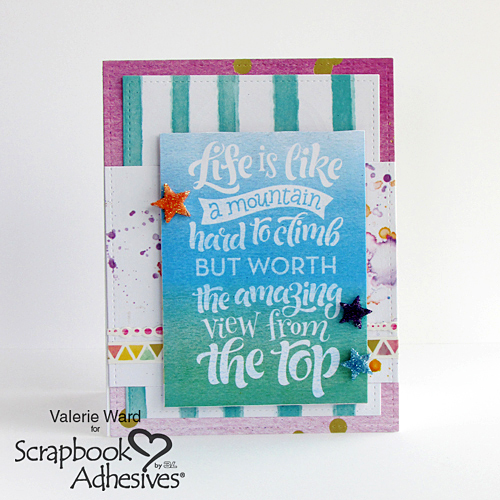 gorgeous card Valerie..I adore those little stars.. Wonderful note cards. Thanks for sharing your ideas. OMG What Spectacular Creations by Judy Hayes and Valerie Ward They are all so Gorgeous!! Each gal came up with an abundance of Brilliant and Ingenious ideas using all of the Fabulous goodies!! They each did an Incredibly Super Outstanding Creative job!! They definitely have spread the Paper House and Scrapbook Adhesive Creaftabulous inspirations in abundance. Thanks so much for the chance for your most generous giveaway!! YOU so ROCK!! I agree that keeping a few of these beauties on hand to give as small gifts is a great idea. Even better is having a card that matches the gift. That’s something unique that only crafters can do. Lovely idea! to see that you are using it this week. sure! Love these note cards. I love the colors on the card! I love the backgrounds. I especially like the orange one. Love the notecards with magnetic closures! I love the mountain card. Printed a photo and stuck up on the idea board. Love the butterfly notepads and card set I am going to make these for some gifts I need. Cards are WOW! Need adhesive! Oh my, these are pretty!!!!! Wow! Great collaboration!!! Love both your products! Lovely projects! The color washed papers are beautiful, as well as the butterfly stickers. I also need those glitter stars! The note pads are great gift idea. And the card is fantastic with all the layers and colors. Thank you so much for the inspirations today! Such pretty cards and projects- so much sparkle! Love the cute little note pads. Hi, I LOVE your products, they work awesome on any project I am doing and speaking of projects, I love all the projects today and the cards, so beautiful, love the colors, the shine. I love sparkle very much. They did awesome. Love to win this giveaway…….. The foil is so lovely and sophisticated Love the look and feel it creates. Love the butterflies. They shine so beautifully. The background colors really show them off. Such pretty cards! Love the foil! Love butterflies! The cards are pretty, thanks for sharing and a chance to win.